Personality preferences are a way of classifying a person’s natural tendencies. There are four pairs of opposing preferences (for example, Extraversion vs. Introversion) for a total of eight. While all eight are used by every person to different degrees, a person will lean more toward one than the other. Each preference is noted by a single letter (such as E for Extraversion). Different combinations of these preference letters make up a person’s Personality Type and Temperament. 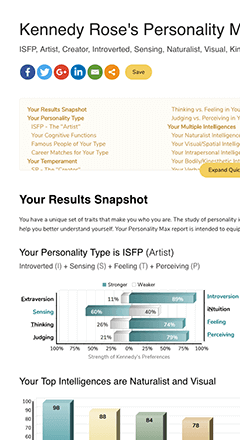 For example, if a person’s preferences are Extraversion (E), Sensing (S), Feeling (F) and Perceiving (P) then their personality type is ESFP. Similarly, that would classify the person as having the SJ temperament. Preferences along with Cognitive Functions are the core of the 16 personality types. You can read about the preference pairs by clicking the articles below to determine for yourself which of each you tend towards. You may also Take our free Personality Test to help determine your preferences and to see charts showing to what degree you prefer one over its opposite. Extraversion (E) and Introversion (I) describe how a person directs their energy either outwardly or inwardly. You use Sensing (S) and Intuition (N) to receive and process new information by using your five senses or in more abstract ways. The Thinking (T) and Feeling (F) preferences refer to how you make decisions, either by objective logic or subjective feeling. Judging (J) and Perceiving (P) are how you interact with the world outside yourself, either in a structured or flexible manner. Learn your preferences, personality type, temperament and more. 2,434,958 tests have been taken so far.